Assess if your KPIs, metrics and performance measures are good enough with this checklist of criteria for excellent measures, and free online diagnostic. For your measure to be excellent, it must have a clear line of sight to your business direction – to your strategic goals or priorities. If you are measuring something, and improving it won’t make any significant contribution to achieving your strategy or goals, do you really need to measure it? Tip: Design your measures at the same time you formulate your goals. 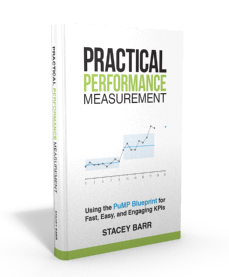 Unless your measure is officially owned by someone – not a department, not a team, but a person – it’s super likely that it isn’t being used to make performance improve. It may not even be properly reported. Measures need an owner to make sure it is reported and used for the benefit of the business. Tip: Find a person who has enough authority to respond to the measure. Vague ideas, surveys and kooky acronyms are not measures. A measure needs to be spelled out in enough detail that you can know exactly how to calculate it, how often and from which data. Tip: Define the details of bringing your measure to life to test its viability. Before and after measures (which is what annual measures usually end up being) don’t give enough feedback to manage improvement efforts. Your measure must be tracked regularly enough (such as monthly or weekly) to give you clues about whether your improvement efforts are working, before it’s too late. Tip: Measure more frequently or find a lead indicator that you can measure more frequently. Measurement doesn’t happen for free. But you need to be confident that the costs associated with its design, data collection and reporting are less than the benefits it brings to your business. And the main benefit is that measurement gives us leverage to achieve goals sooner, and with less effort. This happens through decision making and the resulting improvements you get for your bottom line or your stakeholder value. Tip: Remove waste and duplication from data collection and reporting, e.g. use sampling instead of measuring it all. If your measure is a convoluted index of other measures, or it’s calculation is difficult to explain in everyday language, it can make using it too daunting a job. Involving users in the design of the measure is a great step. And for those who cannot be involved directly, invite them to a Measure Gallery to learn about the measures they’ll use and suggest ways to improve them. Tip: At least make sure your measure names and measure calculations and descriptions are written clearly and specifically, to help people understand what they mean. If your measure is not encouraging people to choose performance-improving behaviour over sweep-it-under-the-rug behaviour, it’s a candidate for throwing out. The measures that are the most potent in improving business performance are those that make it obvious which are the right actions to take to get better performance results. Tip: Always map the relationships of measures to other important performance results, to test for unintended consequences. NOTE: When the diagnostic report is produced after you take the KPI assessment, make sure to take a copy of all the hyperlinks in the feedback recommended for you, and print the diagnostic report before exiting.